This post is written by guest author Abbey Geib. Tuesday Tips is presented by Spin Ultimate; all opinions are those of the author. Please support the brands that make Ultiworld possible and shop at Spin Ultimate! Recruitment and retention is one of the biggest hurdles for various college teams year after year. If you’re striving for a competitive college team for years to come, you need to implement a recruitment strategy now that not only gets new players on the field but has them coming back for more. In an article from 2016, Alex Rummelhart outlined 20 Ideas To Recruit New College Players. I would like to add a few more ideas to that list. A starting point for college recruitment should be at your school’s activity fair. Here, you can collect contact information from every first year walking by your table. Below are some tactics you can implement at the fair and into the future to recruit and keep new players. If your team is cheerful and a little crazy, jump around and dance to loud music to draw people in. If you’re a more conservative team, describe to passers-by what practices are like and the commitment level that is to be expected of players. Attract the type of people you want to recruit by setting the tone of your team from the start. It’s at the activities fair where you’ll get the most people that you can hand out flyers to. Make these flyers stand out with bright colors and photos of people playing ultimate. Ask a creative friend of yours to lend a hand and encourage them to use it in their portfolio for landing a job interview or internship. Make sure to also include specific dates and times of at least three team recruitment activities people can look forward to in the first couple weeks of the semester. 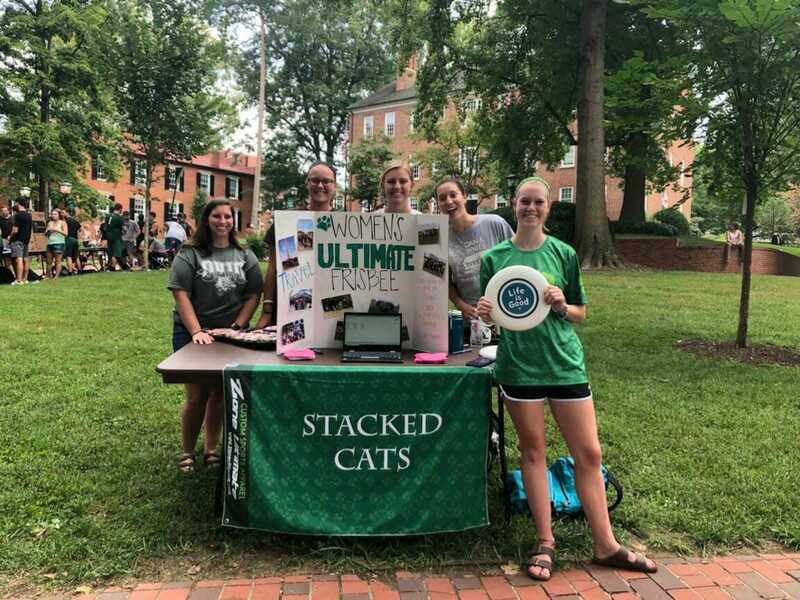 Invite new players to a classroom for a quick meeting to introduce the captains and the other returning players and speak about ultimate a little bit and what the commitment level would be for practices, workouts and tournaments. Make a big name circle and ask people to give their preferred pronouns to give them a glimpse into ultimate’s culture. Break the ice by having them also name their favorite ice cream flavor, what vegetable they would be or what their very first concert was. You’ll get to know these new people faster and in fun and inclusive ways. This meeting not only gives new players a safe and less intimidating place to meet everyone, but it gives you a time to learn everyone’s names and get more information from them including emails, phone numbers and you can gauge their experience level as well. Teach a basic backhand with their thumb firmly against the grooves on the top of the disc and all fingers wound tightly underneath. Then move onto forehand, again with their thumb on top, pressing down and their pointer and middle fingers on the inside rim of the disc. Everyone has different ways of teaching how to throw, but one way I’ve found that works with new players is having them throw the disc hard first, and then once they get the “flicking their wrist” part down, they can work on distance and accuracy. At the conclusion of your first practice, let new players borrow a disc to keep with them until next practice. This will ensure sure they come back to the next practice and get a little throwing in as well. The most highly regarded and unique parts of the sport, spirit of the game not only refers to self-refereeing, but the fact that every player has the duty and commitment to strive to be the most spirited player on the field. You always reach out to help your opponent off the ground. High fives can be given to either team after a tough point. You should always be trying to pick each other up instead of tearing another team down. In the end, we’re all athletes and all trying to win, but not at the expense of the fun of the game. Tell new players about your team’s history and the legends of your alumni, who graduated long ago. Include them in your team’s traditions and show them the way your team does things. Maybe it’s a unique warm up, or a song that the team sings before a tournament. Whatever the case, show these new players what it’s like to be apart of your team. Invite everyone out to a social event to celebrate the new players joining your team. A social event not only shows your team’s fun side outside of practice but it also connects and bonds your team on a different level. Players get to see each other outside of sweaty athletic clothes and cleats and you get to learn more about each other through shared social experiences. This is a really easy thing to do. Give each returning player 1 or 2 email addresses of new players and tell them to invite them to go to practice together or to dinner afterwards. Ask the new person to walk to a social event together or to go out and throw. The possibilities are endless with this one. And it comes with an added bonus… new friends! Ask some of your returning teammates with cars to plan a date and time to take new players to go buy cleats if they don’t have them already. No one feels good when they’re not prepared for a sport they’re trying to play. Make this easy for them so they’re not scrambling to get the equipment they need. 8. Go To Your First Tournament, ASAP! This is super important. If you don’t show the new people what ultimate is all about quickly, it’s going to be harder to get them hooked with just practice alone. Tournaments are a really good representation of the community and the culture of ultimate. Go in having zero expectations, let the returners teach as much as they can to your new class of players and watch your team start to grow. If you can’t get enough to travel, think about hosting your own mini tournament! This is harder to do but not impossible. I know that coming back to school means hanging out with friends you haven’t seen all summer. But remember, you have all school year to see those folks and only a few weeks to make a lasting impression on new players. Take that into consideration and make time to hang out with the newbies. They will be super appreciative and you’ll help out the team tremendously if they stick around. My last and final tip I’ll give you: Give new players a small role on your team. Whether it’s a spirit project for their first tournament. Asking them to make up a song or cheer for your team. Having them make cards for a tournament buddy. Giving someone a responsibility will make them more likely to continue to help out the team and come back again. Those are just some ideas you can utilize to recruit and keep players for a healthy and growing team. Bonus tip: If you can find an experienced player to help you out with practices, use them! This will take a lot of stress off the captain’s shoulders and they can have time to worry more about other more important facets of leading a team like gaining new skills themselves and helping to create team chemistry. What has your team done for recruitment in the past that worked? Share your ideas below in the comments section. Abbey “Gail” Geib majored in Interactive Multimedia at Ohio University where she captained the Stacked Cats. She also has a master’s degree in Public Relations from Kent State University. She’s lives in Cleveland, OH and has been playing ultimate since 2009. She has played for DiscOH, North Coast Disc Co and currently captains Notorious CLE. Abbey also coaches Oberlin College’s B team and enjoys helping other players improve and fall in love with the sport of ultimate. Ready to share your own Tuesday Tips? Send your story ideas to simon@ultiworld.com. Comments on "Tuesday Tips: 10 Ways To Recruit And Keep New Players On Your College Team, Presented By Spin"